An intermediate-level counted canvas design. 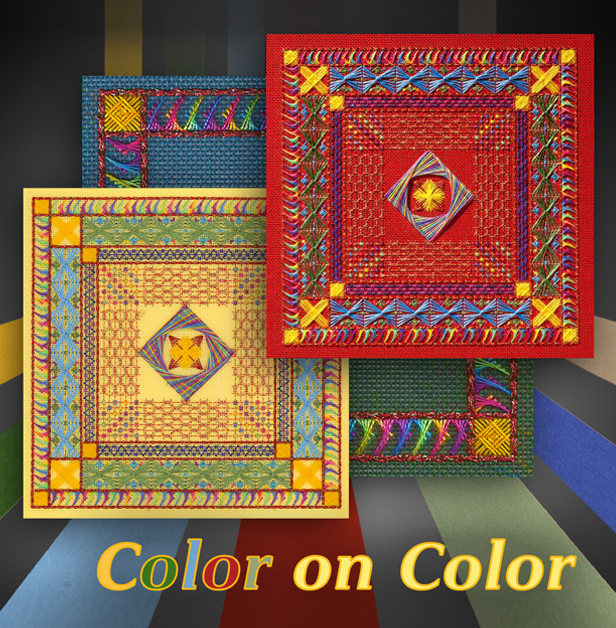 The design is worked on your choice of color of 18-mono canvas. There are three main thread colorways included in the directions, each based on a ThreadworX #8 overdyed pearl cotton. The original colorway (pictured) is based on ‘Bradley’s Balloons’, and we’ve added colorways based on ‘Indian Tapestry’ and ‘Mosaic’. In addition to the overdyed pearl, you’ll work with threads like Kreinik metallic (6 different colors! ), Impressions, Neon Rays +, and Petite Sparkle Braid. Fun with Color!